Water is so damaging that the Chimney Safety Institute of America (CSIA) has called it the greatest enemy of masonry chimneys. Preventing chimney water leaks is one of the biggest maintenance responsibilities for homeowners, and Olde Towne Chimney & Fireplace Sales specializes in helping the residents of Louisville keep water out of their chimneys. 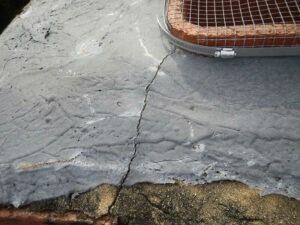 However, chimney water leaks do occur, and it can be a challenge to pinpoint the source of the leak. These leaks can come from several different chimney issues, and we would like to tell you more about these issues and how we can help to correct any problems that could cause a water leak. Protecting the very top of the chimney with a chimney crown is very important in preventing water leaks. Without this chimney component, you have an open hole on your roof where water can easily enter. Your chimney crown is made from mortar, which can suffer from erosion damage because of its constant exposure to rain, ice, and snow. When your chimney crown becomes cracked, water can seep through the cracks into the chimney. Olde Towne Chimney & Fireplace can repair your damaged crown, and if we find that the crown is damaged beyond repairing, we can construct a new crown to perfectly fit the top of your chimney to protect it from water leaks. Masonry materials like bricks and mortar are naturally porous, which means they easily absorb water. The trapped water inside these materials can cause extensive damage in the winter due to the water freezing and expanding inside the bricks and mortar. When the weather warms up, the water thaws and causes the bricks and mortar to crack and break apart. Repeated cycles of this freezing and thawing can lead to serious structural damage because the cracks and gaps allow even more water to get inside the chimney in the form of water leaks. Our expert masons can replace damaged and missing bricks and mortar joints to restore your chimney. After we have completed these repairs, we can apply a waterproofing agent to your chimney that will prevent water penetration and reduce freeze/thaw damage. To protect the vulnerable area where your chimney meets the roof, you need a customized flashing system to keep water from leaking into your home. Consisting of metal sheets that are wrapped around the chimney at the roof, flashing provides a watertight seal. Over the years, flashing can get damaged by corrosion, strong storms, and wild animals who are attempting to get into the chimney. Olde Towne Chimney & Fireplace Services can repair damaged flashing as well as install a new customized flashing system to give your chimney the best protection against water leaks in the area where it meets the roof. If you suspect your chimney has a water leak, contact us at Olde Towne Chimney & Fireplace Sales today. We can find the source of the leak and make the necessary repairs to keep water from damaging your masonry chimney.